You can earn $100 at Jenson USA for your Vital MTB member reviews! See the best reviews from last month's Top Reviewer and learn how you could earn the top spot in May. Continental Der Baron Projekt Tire - "The Der Baron Projekt is now my go-to tyre for general duties. At just 925g per tyre I wasn't expecting them to hold up to the local trails, which are generally rocky (slate), technical and fast. 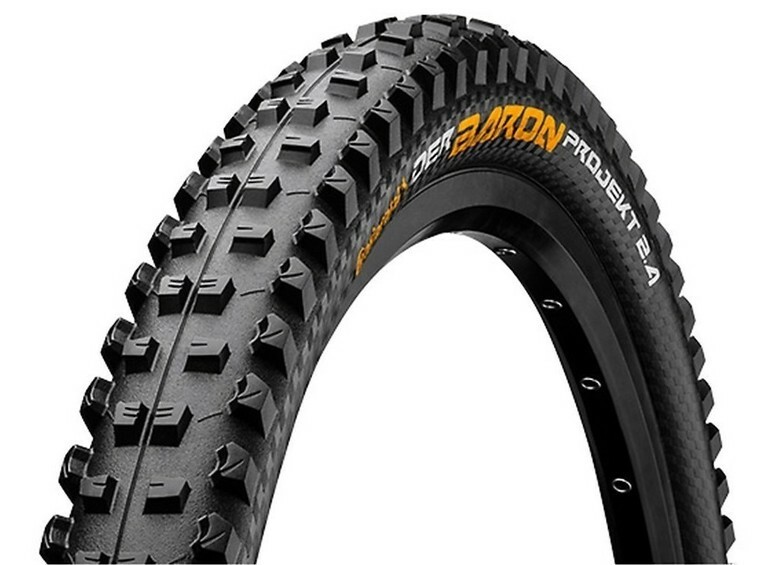 However, I was wrong - they've already lasted longer than Maxxis Double Downs (DHF) and Schwalbe Super Gravitys (Magic Mary) and show no signs of giving up anytime soon. I would put the grip on a par with Magic Mary Addix Softs. I still go to MM Ultra Soft downhill casings for uplift days and alpine holidays, but this is just for that extra bit of grip and the ability to ride lower pressures. For any days that involve climbing (95% of my riding) the Baron Projekts are simply superb. I run the back at 27-28 psi and the front at 24-25 psi and at these pressures the casing support leaves nothing to be desired. If there was an even softer compound available I would probably stick one on the front, but I'm more than happy with Black Chilli in reality. The only issues I've had is setting them up tubeless. A quick search on Google showed others having the same problem, and it appears to be the releasing agent on the inside of the carcass and/or the bead. Wiping these with isopropyl alcohol, rinsing off, then setting up tubeless solved the issue and was a pretty painless process. Big congrats to Basher! Thanks for helping out the riding scene with your thoughts on this product. Want to be in the running for May's award? Start reviewing the parts you use in the Vital MTB Product Guide and keep an eye on the Top Reviewer leaderboard. We'll announce the winner in early June. Conti just released new mtn line with updated/tweaked tread patterns and newly redesigned Protection casing. All of the tubeless seating and seepage issues have been resolved they claim.